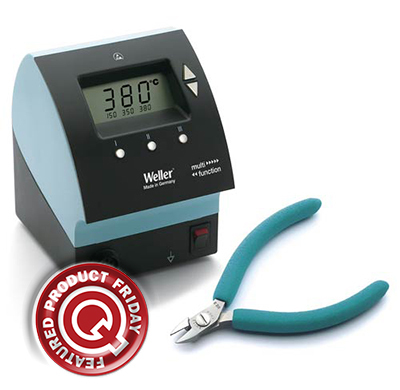 Save 15% off the MSRP on Weller WD Series Micro Digital Rework Station w/Erem 612N Diagonal Semi-Flush Cutter (Q Source SKU: P999-000873) when you use our FPF081514 Coupon Code. This Featured Product Friday (FPF) promo is valid from today, August 15, 2014 through Sunday, August 17, 2014. This exclusive Weller/Erem Combo (MFG Part Number: WD1M/612N) includes the ESD-safe Weller WD1M Micro Digital Rework Station (featuring an extensive special functions menu) and the Erem 612N Diagonal Semi-Flush Cutters (featuring a small, oval-shaped head perfect for micro-electronics use). Regularly listed at $271.90, but with our FPF code savings you’ll get it for just $230.00. While this is a 3-day limited-time price, the coupon is unlimited. Use the code as many times as you like while it is valid—and please feel free to share the code with your friends, colleagues, and via social media.